With evidence of wrought iron dating back to 400 BC in ancient China, the art of iron welding, shaping, and weaving has evolved over the centuries to become a modern, practical art. 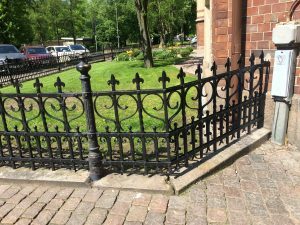 A well kept iron fence can last for centuries. Come with us an a tour around the world to see the different styles and techniques of wrought iron. Using traditional blacksmithing methods or newer mechanized techniques, iron can be teased into any 2D or 3D geometric shape. These orbs are organized in a subtle alternating pattern, creating a mesmerizing effect. With numerous tools and techniques at our disposal, any design is at our fingertips. This garden fence is a romantic twist to traditional Medieval fences. The pointed tips, which once represented danger, now symbolize Cupid’s arrow. Wrought iron is the perfect medium for abstract and symbolic art. 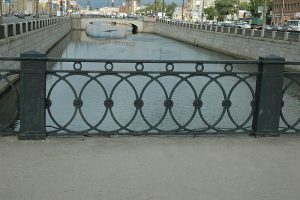 This decorative fence lines the Krasnooktiabskii Bridge in St. Petersburg.The complex pattern is constructed from a few basic molds welded together with ease. 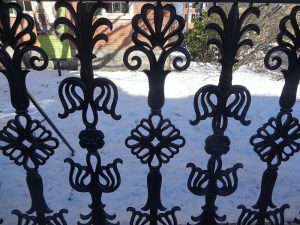 This is one of the simplest forms of wrought iron to date. This is the fence bordering the Gardner-Pingree House, an icon of western architecture. Built in 1804, it was immortalized in history as a national landmark. Each piece took time and patience to construct but has lasted beautifully through the years. 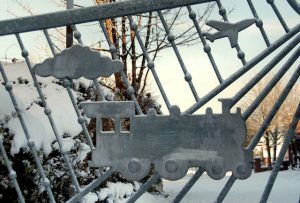 This gate in Belfast, Northern Ireland is a tribute to the local airport and train station. Custom designed and plasma-cut pieces are a modern addition to the ancient art of wrought iron. The same technique can be used to construct playful park fences and unique door handles. Little-known fact: The Eiffel Tower is constructed primarily of wrought iron. Weighing a total of 10,000 tonnes, 6,200 tonnes are puddled wrought iron. 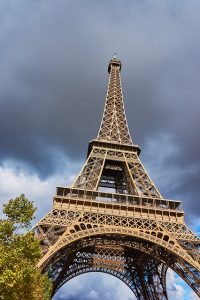 At the time, the Eiffel Tower was the tallest building in the world, and there was significant opposition to its being built. The three architects felt the webbed construction offered the best defense against the wind, which might otherwise cause it to collapse. 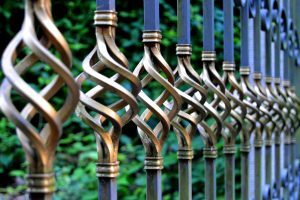 Through welding, plasma cutting, shaping, weaving, powder coating, and antiquating, we can build a wrought iron fence of any design. Please contact us to find the gorgeous wrought iron style for your budget.